To take sensation and presence as concepts through which to look at Bacon’s art seems appropriate given his recurrent concern with pure feeling in his subjects and with his characteristic rendering or dismembering of the human form. In much of his work we experience the sensation of distorted presence and the presence of violent sensation. 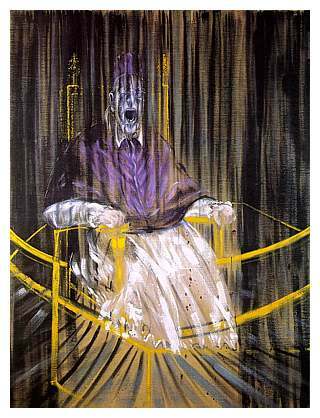 Sensation for Bacon’s subjects often entails pure anguish without the presence of the source of pain, an anguish that can be verbal in the quasi-audible screams of a pope yet this anguish is non-verbal or empty of sense given the lack of discursive narrative to distract from sensation. To take one of the ‘screaming pope’ pictures, or many of the portraits, we are presented with a feeling subject that is simultaneously an object of pain and/or distortion. There is a confrontation, by means of a distorted representation of the likeness of a sitter, between the spectator and the raw experience in the subject/object that engenders its own deformity, a deformity perhaps conceptually engendered also by the gaze of the spectator. Bacon’s characteristic disjuncture of conventional figuration and its thwarting provokes a shock that becomes a contagion spreading from the sitter-subject-object to the spectator-subject-object. The long-cherished aesthetic sensibility of decorous mimesis or the faithful representation of nature is in this way sundered and problematised by Bacon. It is not, however, abolished: Bacon permits its residue as a pointed part of the disastrous dissonance between it and chaos or perhaps as part of a ‘distortion into appearance’ whereby pure sensation that is anterior to discourse and the rationalisations of the faculty of understanding peers through the broken wreckage of the human form, especially the face. 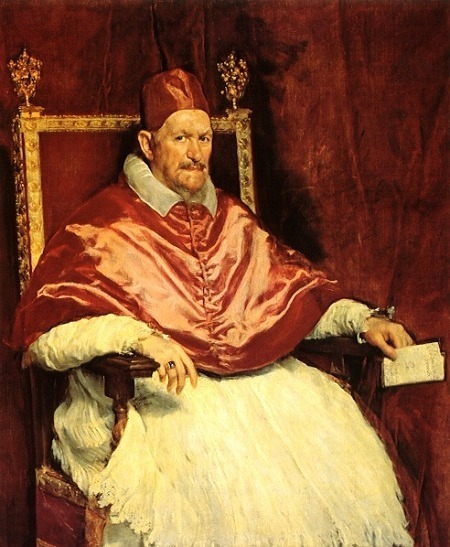 To compare Velazquez’s Innocent X portrait and Bacon’s analogous screaming pope of 1953, Velazquez’s pope is the essence of austere eminence, decked in the lush finery of his position. Whether Bacon’s pope is the attempt to portray a particular human in distress or the attempt to show an Everyman, all humans being susceptible to the yawning void of existential meaninglessness irrespective of earthly station, cannot be determined by pictorial evidence alone. Sensation is Bacon’s overriding theme. It is not only portrayed but embodied in a double-sense. The sitter can be shown in the moment of the feeling of pain, his/her face or body contorted by it; but also, this contorted body is the site and physical manifestation of pain, i.e. it gives pain a ‘body’ and visual actuality. The source of this pain is rarely if ever represented by Bacon, providing a testament to a psychic crisis manifested physically rather than a physical crisis. 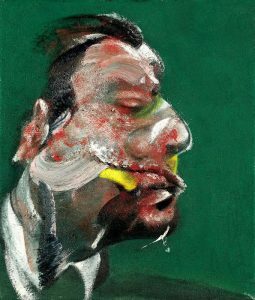 In omitting the source of pain, Bacon obviates narrative and focuses on a single instant in which, in many of the portraits – where pain could be maintained to be absent – a violent movement of the forms deface the forms themselves. 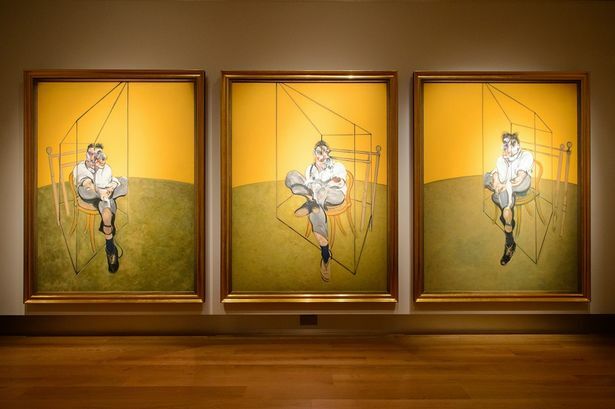 The arguable incompleteness in terms of realistic verisimilitude of Bacon’s sitters could be argued to be in inverse proportion to his rendering of their presences. They lack realistic visual completion while at the same time, and perhaps because of this, an aura or ecorce essence – of pain or of the sitter – makes inroads into the void afforded to it. This would be to contradict the reading of Bacon’s figures as mere meat and would suggest rather the corruption and senescence of the significance of the flesh altogether, in order to pave a vision not of spiritual faith but the raw nihilistic agony of its impossibility. 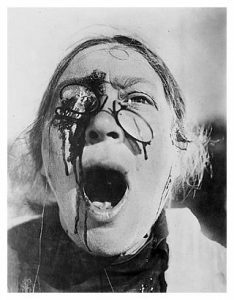 Thus the vision is of the soul that is redundant, eternally bereft of its own meaning. outward, e.g. in Study for the Head of George Dyer. In the latter picture, the sitter is seemingly stolid and impassive but there are the painterly effects of violent movement and defacement. However, Bacon’s sitter in this instance cannot be reduced to the status of an empty vehicle for a discourse between artist and painter. Given the head’s occupancy of the majority of the picture space, the portrait can also be seen as a wry iconic tribute to Dyer who is analogically co-present with the index of Bacon’s violent application of paint, i.e. violence itself. Dyer’s closed eye could indicate not merely his juxtaposition with violence but his suffering of it as a physical blow; or could show indeed his pacific co-existence with Bacon’s swirling aesthetic, a happy marriage of content and form – or even of sitter and painter who is present through the metonym of his idiosyncratic aesthetic. Dyer’s presence in the painting has the quality of a mystical icon, albeit in profile, or an apparition. The head is incomplete, evaporating behind the ear, Bacon blurring the usual polar figurative construct of figure and ground. The sitter is present as subject-figure but is absented by the ground or ‘absent in the ground’, the backdrop almost becoming thereby an ectoplasmic emission from Bacon’s sanctified subject. Therefore, Dyer is present as overt subject, and present as residual subject in the ground as well as in Bacon’s impasto which serves as an overlying patina (or prism? ), the non-naturalistic colours of which interrupt the flesh tones of Dyer’s face beneath.